Central Greater Cairo, which includes all of Cairo Governorate, Giza and Shubra al Khayma city. Greater Cairo’s deserts comprised of the eight desert new towns found around Cairo. Central Cairo has developed to become a compact and dense setting, with small roads, pedestrian friendly in many places, and with buildings that are really attached to each other. The growing population, and the increasing density, created the need of expanding to the surrounding areas. 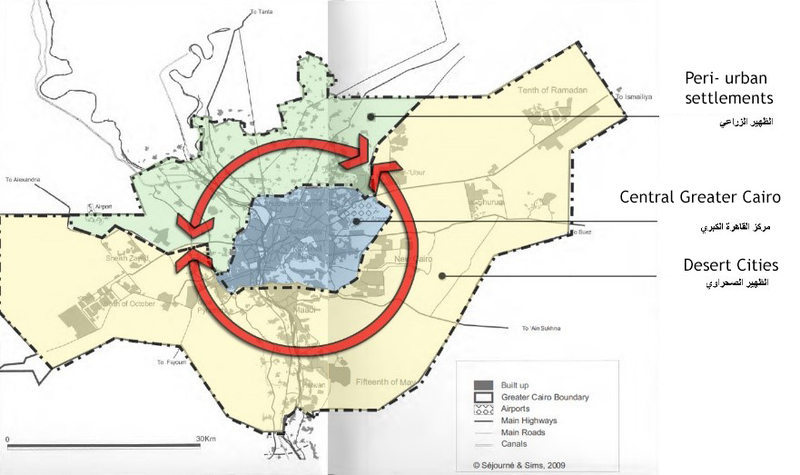 Trying to relieve the center of Cairo from the high densities, the government started to develop further out of the Nile valley and investing in the desert. Despite the planning and investments on the new towns, the expected population target for the new Desert Cities, was not achieved as the lack of services and transportation, and the high prices of housing delayed incoming of people. The change happened gradually, and slowly with the development of New Cairo (east) & sixth of October (west), closer to the capital. And that’s how desert cities started to attract people in. 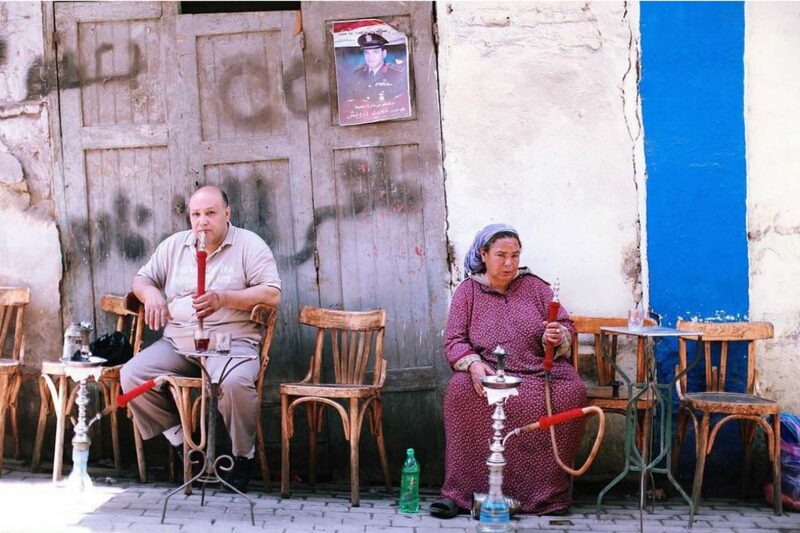 Egyptians like to sit outside- and the management and governance of public space is taken over the community, especially in the informal settlements where they maintain their streets, services etc. Normally the people of the area are the ones that take care of the streets and have created the self-governance model. 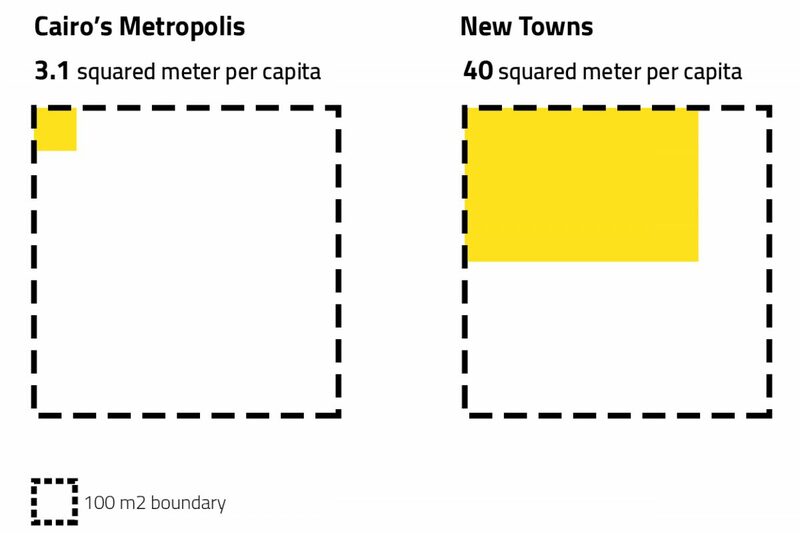 The new towns on the contrary, are very differently formulated with wide streets, low-density buildings, more horizontal planning, a lot of gated communities. 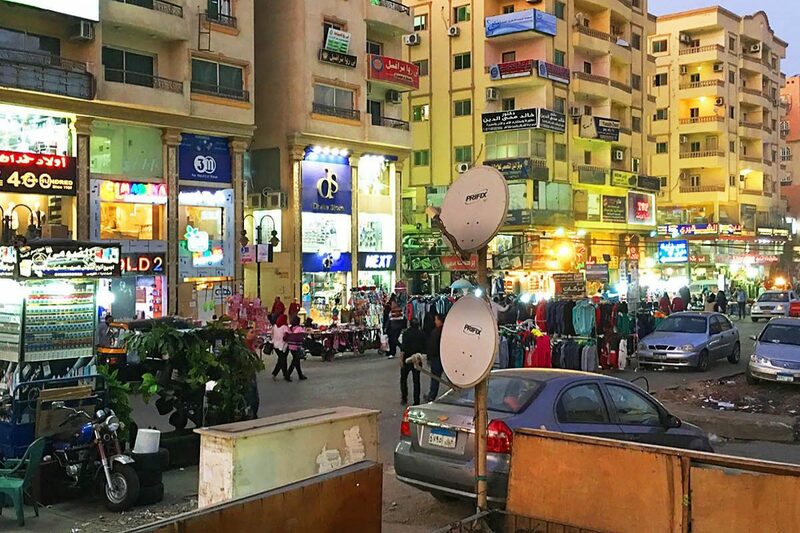 Public realm is characterized by vast spaces in comparison to central Cairo, with wide streets, big green open areas, huge squares and medians, huge distances from and to the different spaces. In general, new towns have a lot of public spaces but they are not well programmed. They are mostly underutilized and not very communal. On a governance level, new cities are different because people are not really interacting, and there is not the neighborhood feeling, even in the successful ones. 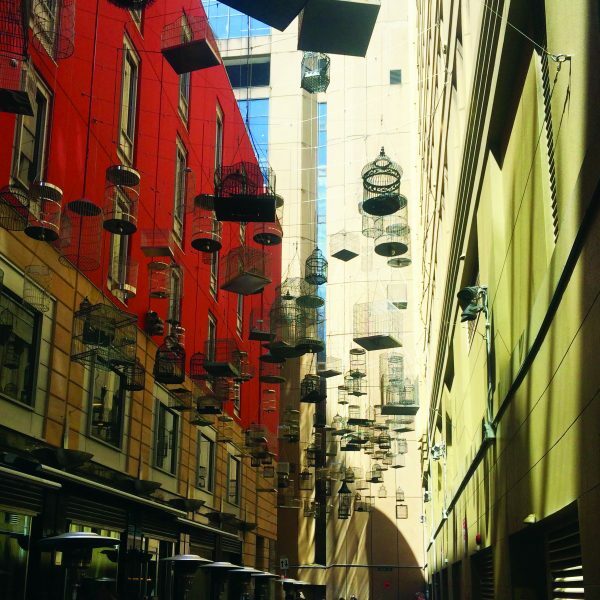 Al Hossary district or Sixth of October downtown, is located on the commercial center of Sixth of October. In the district there is retail and services on the ground level and offices and residential units in the rest of the building. This mix of land uses is making the Al Hossary area one of the few areas appearing mix of land uses. 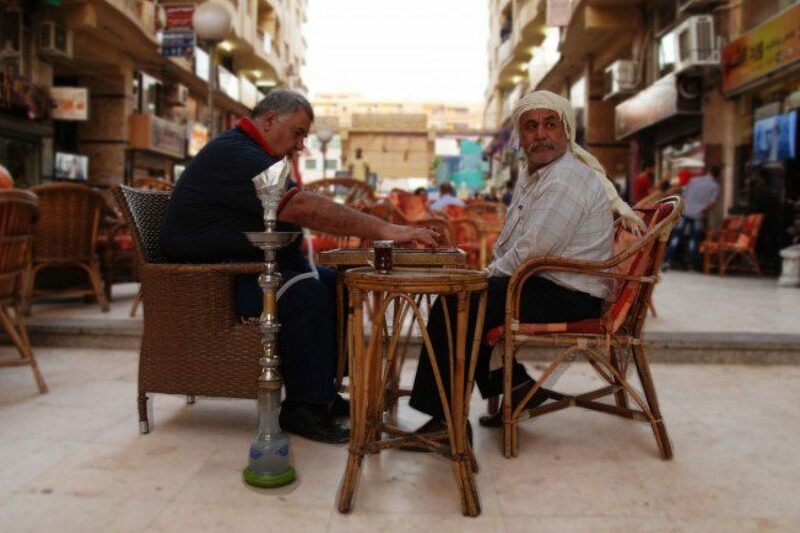 There, Little Damascus, a community of Syrians that moved to Cairo, has developed. Its high density area, accommodates a diverse population and attracts a lot of visitors with a great mixture of ages and social groups. The big amount of Syrian refugees living there are encouraged to live and integrate with the Egyptian communities. They have started working themselves into the area and have contributed to the informal and formal economy through hand crafting, textiles, food business and other fields, creating vibrant spaces. Cities were very well planned but in Little Damascus and Al Hossary area informalities started thriving into the city. There are a lot of informal vendors around the mosque and a lot of people selling stuff into the area. The informality has started with the vendors and then it continued with the Syrian street. In general, people added culture to the space, turned it into place, and added the flavor to the area. Little Damascus is very aligned with how Central Cairo is. I started to question what makes a place successful. How are we testing that and evaluating that? What are the means that decide which place is good? 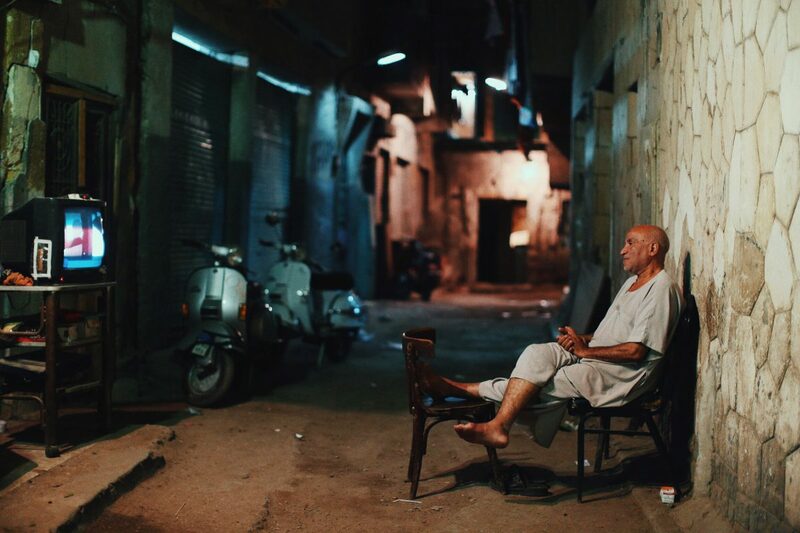 The needs that a city like Cairo has, are completely different than that of a western city. There are a lot of cultural, political, economic differences. The key success factor of Little Damascus is the introduction and manifestation of the community’s culture into the urban fabric. What lessons can be taught from the successful example of Little Damascus? On a physical level, the mixture of land uses is the number one factor of why this place is successful. The coexistence of services, stores, restaurants and many food options, managed to attract many people to the area. In a community level, Little Damascus is a model of how integration between immigrants and locals could create a home for them and also a lot of opportunities for locals in the area leading to a very successful city. Syrians contributed to the economy, by making the area better and creating a lively, vibrant space, and even by creating job opportunities for Egyptians. On a governance level, high social interaction and high ownership of the immigrant community is very dominant and creates a feeling of being at home. The management of the place is highly dependent on the Syrian coalition and they need to sustain their governance. This self-sustaining governance model, could be a threatened by a privatized model of space. There is a big question on how to apply this successful case in a bigger scale. 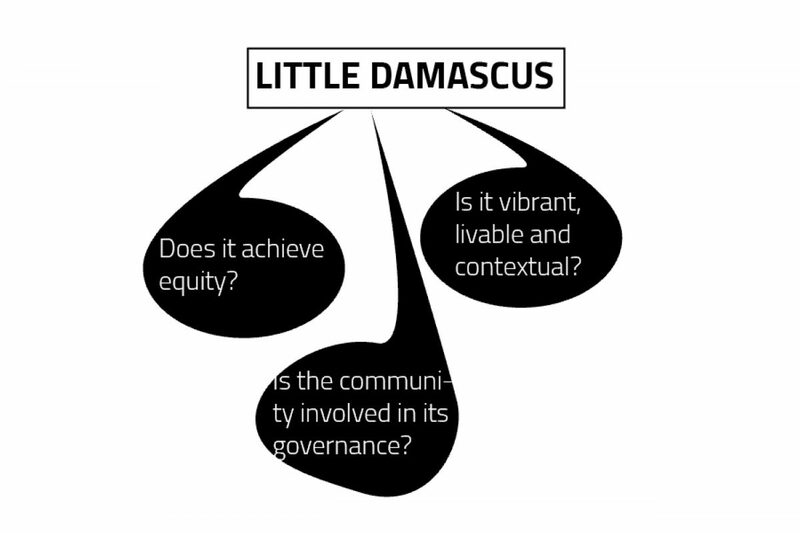 From the micro scale that Little Damascus is, to macro scale, where placemaking is sort of a strategy. To create more accessible, more equitable, livable places. The example of Little Damascus is only a model. There is a need to ensure that, from a city perspective, each neighborhood in the new cities is developing spaces that are utilizing the space between buildings. A second step to take is, to look at the macroscale, from the block level to the neighborhood level and to create cities that are more opened up and more community oriented. It is important to provide place-sharing, place- living and place- keeping through a strategy that it is bottom up, and also community based. 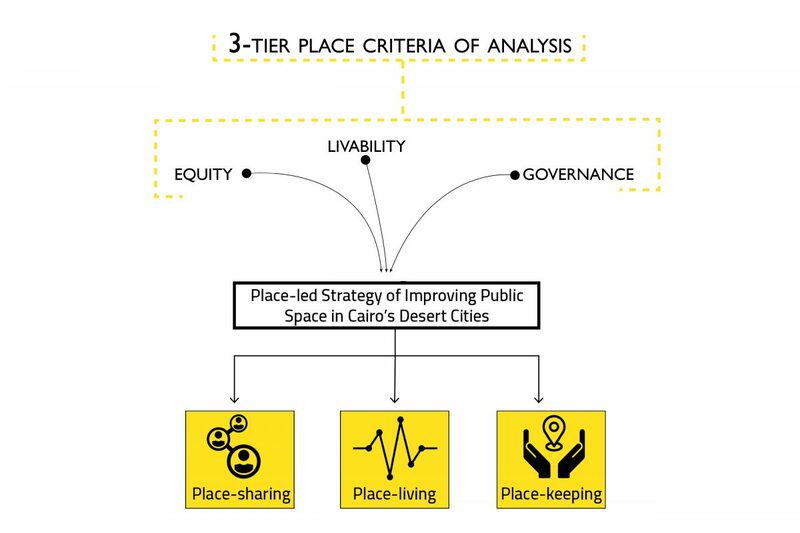 The approach of place-led development will not only connect and make efficient the spaces between buildings leading to more socially-knit communities but also build a governance strategy based on a preset ideology of community-based planning and local development of city spaces.